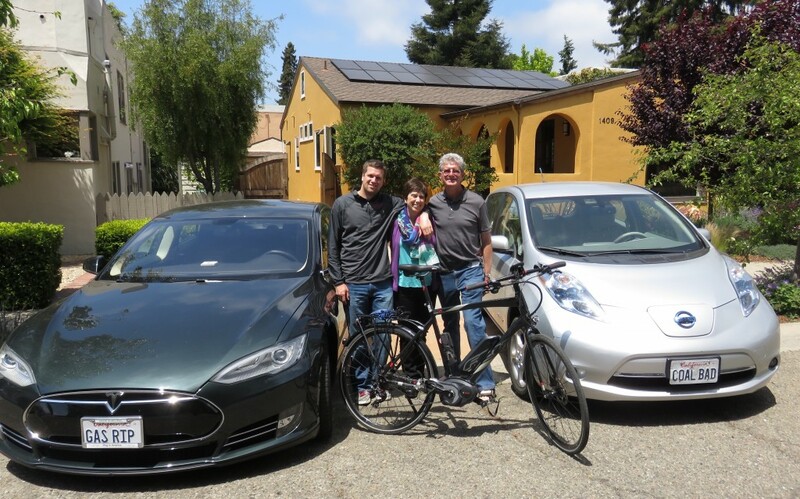 That’s our family with with our two plug-in cars and e-bike fueled from the sun. Plates: GAS R.I.P & COAL BAD. I’m an ex-entrepreneur, cleantech advisor and investor, now a full-time climate hawk. And I’m stretched too thin. I’ll be at the all-important Paris Climate Summit from November 28-December 2014. Before/during/after, I’m looking for an energetic colleague to help advance some some well-received, ambitious, still-embryonic climate ideas. Are you imaginative, enthusiastic, capable, and entrepreneurial? Are you already immersed in the climate crisis and following organizations working on awareness and solutions? Do you see yourself getting involved in world-changing projects? You or someone you know could jump in, starting as my part-time Personal Climate Assistant — PCA. As the first PCA anywhere, you can help create a new job category: Too-busy entrepreneurs and other citizens can hire people to spread information and ideas out to their networks. Candidates for PCA, deeply invested in climate issues, will jump at the chance to get paid to do what they care about most. Ideally you’re someone who’s not like me (an older white guy). You’ll use your talents and experience organizing, listening, writing, planning, persuading, and evangelizing. I can help mentor you towards a long-term climate career, full-time if you want that. Meanwhile, we’ll do useful work and you’ll get connected with movers and shakers. ABOUT ME: I’m a lifelong startup person. See links at http://FelixKramer.com. I organized a successful eight-year-long campaign to get automakers to build plug-in hybrid cars. (At CalCars.org it felt great to win one!) Through and since that effort, I’ve built a diverse network. So I can enlist help to launch home-run projects from smart, resourceful, influential people, and their friends and colleagues. MY WRITING: I’ve recently published articles in The Guardian, HuffPost, Houston Chronicle, and Grist, all aiming to expand awareness of our urgent climate crisis — and the solutions we already have, once we as a society decide it’s worth ensuring a livable world. Hey, Catch Today’s ClimateMinute! Daily short audio and still-video climate messages: moving, funny, inspiring, alarming, ridiculous, provocative, urgent, galvantizing, produced by teams of young climate hawks. Climate Clubs & Climate Year: Two routes to build a climate focus into everyday life that we can prototype in the SF Bay Area. YOUR OPPORTUNITY: For the right person, this can be your entry point into a career in climate advocacy or green business development. Feel free to pass along a link to this page or PCAFlyer-1Nov2015 to anyone you think might fit). YOUR BACKGROUND: Have you been an Organizer at a non-profit organization or campaign? Do you have BizDev experience at a startup? Or are you in your last college year or just out? Do you enjoy writing persuasively and know your way around social media tools? You can help shape and promote ideas evolving from concepts to teams developing prototypes. Get ready for the Paris Climate Summit. Plan strategies to recruit initial teams and integrate advisors. Try an innovative way to assemble an affiliated group of climate-focused entrepreneurs for sponsorship to support your continuing work. Set up and manage a project workgroup (I use tools like BaseCamp, Evernote, Fuze, and Slack). APPLY: Please send a thoughtful cover letter to assistant [at] beyondcassandra.org. Include your reactions and ideas about some of the ideas and projects at http://BeyondCassandra.org, and how your involvement would fit with your aspirations. Please include pointers to your website or LinkedIn and any writing or other samples (no attachments, please). Be sure to describe your compensation expectations and mention how you heard about this opportunity. I’ll be sure to get back to you if I see a fit. Meanwhile, thanks for all you’ve done and will do for our futures.